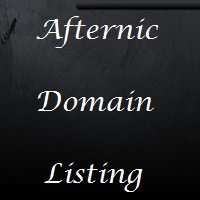 Afternic is big marketplace for domain name buying and selling. You can park your domain names with afternic also. Afternic provide escrow service for buying and selling domain names as we all know escrow service is best for domain name buying and selling. Escrow secure both buyer and seller. One thing which we need to say about afternic is that its user interface is very good. You can appraise your domain names also with afternic. Afternic provides affordable domain name appraisal by domain name industry experts. In its appraisal certificate afternic also provides the DNI score. After Domain Listing and Domain Parking are two easy process in it. (1) First we need to sign up for a afternic account. (2) Go to portfolio tab in the left and click “Add Domains”. (3) Type your domain name and press continue. (4) Now provide them buy now price , floor price and minimum offer price for your domain name and then press enter. (5) Now check your details and press submit for processing. (6) You have now submitted your domain name. (7) If you want to park your domain name then login to your registrar account. (8) Replace your domain’s name server with afternic’s name server. buy now price is the price from which buyer can purchase direct domain name while offer price is the minimum price for a buyer can offer you. Floor price is the price below which seller do not want to sell his domain name. You can check your domain name is listed or not in the afternic by going in All Domains in Portfolio tab. Here would be listing of your domain names. Afternic provides very good facility to park your domain. It provides different kinds of template and also provides facility to enter your keyword for your domain name. Afternic payout method is from paypal. minimum payout limit for parking revenue is $25. Afternic provides your parking payment of this month to next month of 15th date. If you want to get parking revenue of afternic then you need to fill Tax form and then submit them by email. This was all about the afternic domain listing and parking. i will help me alot in my domain invester carrier. thankyou ujjwal sir.